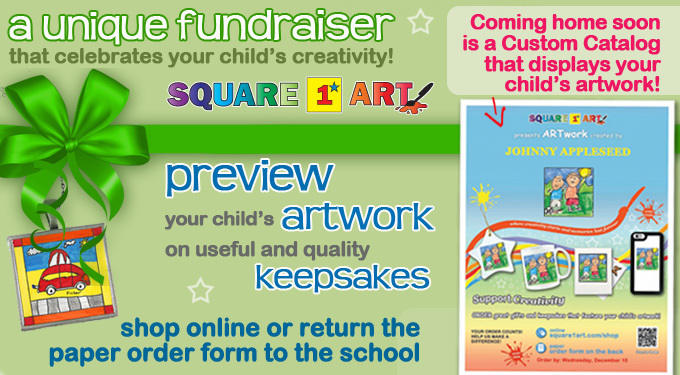 Coming home to you soon is a school sponsored fundraiser called Square 1 Art. This fundraiser takes your child’s artwork and makes it into great products for you to purchase. These products are wonderful keepsakes and gifts for family and friends. Your child has been busy making beautiful artwork that can be made into many fun products such as magnets, t-shirts, mouse pads, ornaments and much more! The money raised from this fundraiser will enable the school to continue its efforts in supporting our students. Your help is needed for us to continue offering these opportunities to our school. All items will be received in time for Father’s Day! Paper order form located on the back of the catalog coming home to you soon. Your child’s very own artwork and name will be printed on the front! Online at www.square1art.com/shop Create an online art gallery using the access code located on your catalog. Shop useful custom products that display your child’s artwork!